Rocket League has an early anniversary update, which includes a new arena, crate, and cosmetic items, along with the opening of the new competitive season. The update will go live on July 7th even though Rocket League’s 2nd birthday is on the 5th. 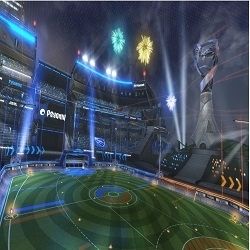 Los Angeles, CA, June 27, 2017 --(PR.com)-- Rocket League is turning 2 years old on July 7th, but on the 5th, Psyonix will release a big update for the game. Players can celebrate earlier with a whole new arena, greater engine sounds, custom goal explosions, and fresh cars. The fifth competitive season will start too, along with a new crate and new cosmetic items. Also, brand new music is coming to Rocket League. The new arena is called “Champions Field,” a standard stadium set in a modern one with all the bells and whistles. It features triple-decker seating, lights bright enough to be seen miles away, and a giant statue depicting the game’s logo. Cars that didn’t have unique engine sound are getting new ones in this update. Psyonix also improved the existing beats, along with new music to the soundtrack. It will feature 18 new tracks by Monstercat available on the in-game radio station. Two more weeks before the big update and the two-year anniversary follows. Are you excited yet? Get ready for the arrival of the new item in the Rocket League Trading market by buying or gathering keys. Collect enough to trade for the items that you want. Otherwise, just continue to enjoy playing the game, and do whatever makes time fly. For the next fourteen days, perhaps it will be wise to polish up your skills for the next competitive season. Aim for the Grand Champion tier. Never settle!